The Montgomery County Police have been exploiting a loophole in the Open Meetings Act to create a number of called “Citizens Advisory Boards” which ordinary citizens are not permitted to attend, observe, or scrutinize the activities of in any way. The matter came to the attention of the Maryland Drivers Alliance when we became aware of the existent of a so called “Citizens Advisory Board on Traffic Issues” (or CAB-TI) which approves locations for speed monitoring systems within the County. The board is specifically mentioned on the County website as part of the formal process by which speed camera locations are selected, and was also mentioned in an Office of Legislative Oversight report on the County's speed camera program. However the board is not listed on Montgomery County's list. The head of Montgomery County's Traffic Division, Captain Thomas Didone, confirmed that there have been no public notices of the group's meetings and that no minutes were kept at any meetings. It was confirmed that the MCPD Director of the Traffic Division appoints the membership of this Citizen Advisory Board and control's the group's agenda. The head of the Maryland Drivers Alliance filed a complaint with the Open Meetings Compliance Board, which monitors compliance with the state law requiring “public bodies”. It was revealed in the County's response that the CAB-TI is actually just one of several Police Citizen Advisory Boards, and that the meetings of ALL of these “citizens advisory boards” are closed to the public. The Montgomery County Attorney asserted in their response that the open meetings act does not apply to the police citizens advisory boards because its members were selected by the Director of the division and that this individual is a “merit employee” rather than a direct appointee of the county executive. It was revealed during the course of our investigation that the CAB-TI's meetings were not limited to discussing speed camera locations. Captain Didone sought to consult with the group while preparing legislative testimony, and of course the testimony prepared by Didone was in complete opposition to the views expressed by this website. It was also revealed that the meetings discussed recent or potential legislative changes regarding other types of Automated Traffic Enforcement aside from speed cameras. 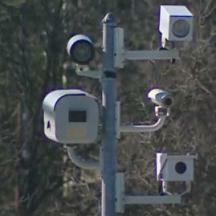 Since the CAB-TI's agendas were not limited to just selecting speed camera locations, and because no minutes or agendas were kept, there is no way for the public or the press to have any idea what other matters might have been discussed or what other matters might be discussed in future meetings. References to the CAB-TI were used by the county in publications as though pubic input was sought. In fact, a member of the CAB-TI submitted a letter to the editor of the Gazette Newspapers supporting speed cameras. This letter was presented as the view of an independent citizen without mentioning the fact that Captain Didone collaborated in the writing of the letter, according to a document obtained under a public information act request, "I want it to be seen as a dispassionate citizen response", wrote CAB-TI member Alan Freeman to Captain Didone. The letter ultimately printed by the Gazette made no mention of the fact that the head of the county's speed camera program participated in its writing. The fact that the CAB-TI is being presented as a form of collaborating with the pubic and as a vehicle for public input, even though all who hold differing views from the official county policy are not permitted to even observe or be made aware of its meetings. It was revealed in the County's response to the complaint that each of the Montgomery County's Police Divisions has its own “Police Citizen Advisory Board” whose membership is exclusively controlled by the MCPD, whose meetings are closed to the public and no public notices or agendas given. Since meeting minutes are not required to be kept, the public and the press has no way of knowing what issues are being discussed in ANY of these board's meetings, who is being permitted to attend, or even whether pending legislation is being discussed. The definition of a “public body” under the Open Meetings Act includes “any multimember board, commission, or committee appointed by the Governor or the chief executive authority of a political subdivision of the State, or appointed by an official who is subject to the policy direction of the Governor or chief executive authority of the political subdivision, if the entity includes in its membership at least 2 individuals not employed by the State or a political subdivision.” The OMA manual specifically states that the OMA can apply to “informal citizens groups” which are carrying out an “advisory function”. The belief of the Maryland Drivers Alliance was (and still is) that by the plain text meaning of the words in the statute, MCPD should be considered "subject the policy direction" of the county executive since they are subject to executive orders, and particularly because county law explicitly states that the selection of speed camera locations is to be done by executive order. 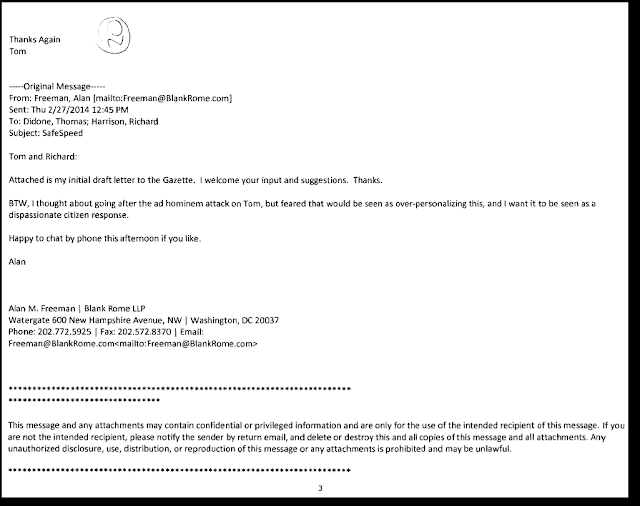 However the compliance board accepted the loophole presented by the Montgomery County Attorney. In so doing they have permitted any local government to subvert the intent of the Open Meetings Act (ie promoting transparency and open government) if they quietly delegate the selection of a citizen advisory committee's members to a merit employee who heads a division. While the county may have the legal resources at their disposal to continue to exist in a loophole such as this one, the fact is that the County Executive and County Council are tacitly condoning this practice which completely undermines the intent of the Open Meetings Act. Leggett could direct the police chief, who is a political appointee, to require the meetings to be open and announced to the public. Or the Council or County Executive could simply designate the committees to be public bodies by an official act. Their decision NOT to do this and that the County Executive permitted the County Attorney to defend this loophole demonstrates that they support the current practice of secrecy. Certainly they could also simply chosen to make the meetings of these groups public, along with information about who selects the memberships of these groups how the public could raise concerns to them instead of using taxpayer funded legal resources to carve out loopholes in open government laws. This same loophole could be exploited to create "citizens" groups studying any issue they wish, arrange to invite only those who agree with official policy, don't even inform the public of the group's activities, and then present their decisions as a public relations stunt claiming that public input was sought. Or, such secret committees could be created without the public ever being made aware at all. 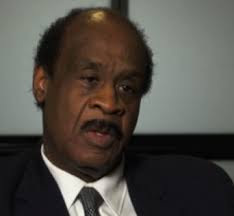 At a time when police activities across the US are under increased scrutiny, it is amazing that Ike Leggett's administration would knowingly permit the MCPD to create of secret committees which exclude any and all potential critics of official policies, and which are excluded from all transparency laws. This is not the only case where Montgomery County has participated in secret speed camera meetings which exploit loopholes in the Open Meetings Act. In October 2013, Captain Didone helped to organize a secret “Speed Camera Symposium” under the umbrella of the Maryland Association of Counties and the Maryland Municipal League (organizations which receive taxpayer funding but which are exempt from the Open Meetings Act because they are not part of any one local government) which representatives of most speed camera programs attended and where pending speed camera legislation was discussed. The Maryland Drivers Alliance was invited by a co-sponsor of the event to send a member to observe, but Captain Didone personally banned our representative from attending because he was affiliated with the editor of this site who opposes speed cameras. The press was also banned from observing the symposium. Captain Didone and two other representatives of Montgomery County's speed camera program also participated in secret “speed camera reform work group” organized by the vice chair of the Environmental Matters Committee (a position then held by former Delegate James Malone). Opponents of speed cameras and those who brought complaints to the legislature were not , and the Environmental Matters Committee claimed that no minutes were kept from the work group's meetings. The leadership of the Environmental Matters Committee claimed after the fact that this work group, which was specifically mentioned by name by both MaCo and Capt Tom Didone in writing, did not need to be made open to the public because it did not officially exist. Your representatives in the Maryland state legislature have long defended a loophole to permit them to create secret “informal” work groups which draft legislation that are not subject to the Open Meetings Act, and thus keep discussions about the motivations for legislation and their actual intent for including specific changes closed to the press and to any who might disagree. Let's be clear, it is a conscious decision by officials within the county government to allow these meetings to operate within such loopholes. It was clearly expressed by the ATEU's letter to GOCA that the CAB-TI meetings are closed to the public BY DESIGN. The county government could make all Police Citizens Advisory boards subject to the OMA at any time. And they could simply not make meetings on controversial subjects closed to the public. They have simply found a way to avoid the intent of the law (open government) and are exploiting it to the maximum extent possible in order to support a culture of secrecy.